Does your school use the NWEA MAP Test? 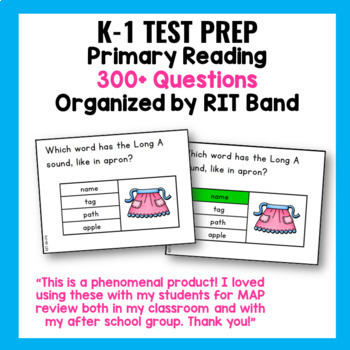 This is a NWEA MAPS test practice set with 300+ full-size question slide pages aligned with RIT Bands 121-200 for NWEA Primary Reading! NWEA MAP Testing is aligned with Common Core Standards. 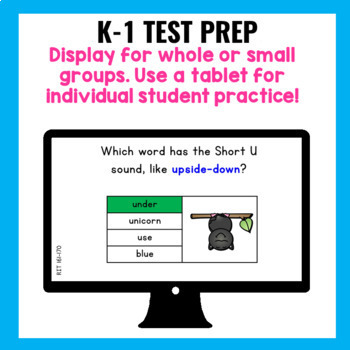 This set of colorful practice question pages will support first graders, as well as provided rigorous practice for kindergarten and intervention skills for second grade. I use these questions for activating prior knowledge before a lesson, as a check for understanding during guided practice, and as an opportunity for my students to "show what they know!" We use them as warm-ups, cool-downs, and our favorite...as a team game! More details are provided in the preview file. There are 300+ divided into RIT band ranges. There is one question per page, followed by an answer page. 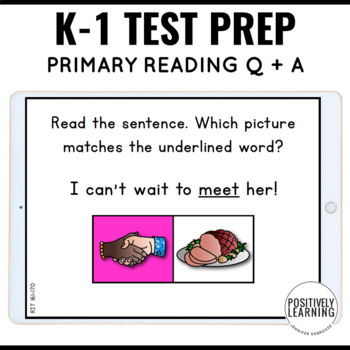 All graphics are in color with clean formatting to resemble the NWEA MAP assessment for Primary Reading. I display the pages on my computer (or smartboard) to use with my students. You could always print the cards using a variety of printer settings (full-page, half-page, and/or quarter-page for task cards). The thumbnails provide a closer look at the questions and format. Please download the preview for a closer look and complete details about the number of cards in each RIT band range. The majority of the cards focus on phonemic awareness, phonics/decoding, and grammar. More than half of the cards fall into the 151-160, 161-170, and 171-180 range. These are the ranges that best support my students throughout the school year. These questions are DIFFERENT than my NWEA Quick Question cards. I made the questions different so my students could benefit from even more practice! This file is a non-editable pdf and features engaging, colorful graphics. 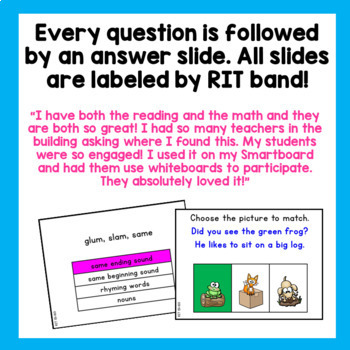 If you prefer printable cards in black/white, please check out my NWEA "Quick Question" cards. Please follow my store to stay up to date on my newest products! The preview provides more information and a closer look at the learning materials.